Thehotel is using Smore newsletters to spread the word online. 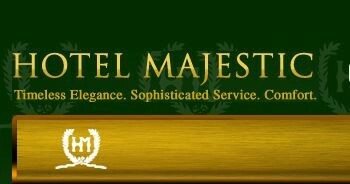 Welcome to the Hotel Majestic! Built in 1902, the charming Hotel Majestic in San Francisco was the only hotel left standing after the Great Earthquake and fires of 1906. It stands mighty, atop a hill overlooking the world's greatest city, San Francisco. The Majestic is rich with history, Edwardian architecture, and even ghost tales. 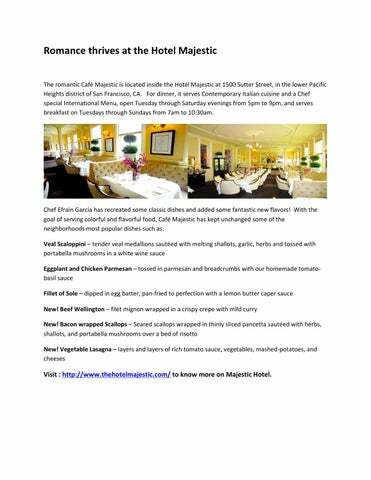 The Café Majestic Menu has been Relaunched! The romantic Café Majestic is located inside the Hotel Majestic at 1500 Sutter Street, in the lower Pacific Heights district of San Francisco, CA. For dinner, it serves Contemporary Italian cuisine and a Chef special International Menu, open Tuesday through Saturday evenings from 5pm to 9pm, and serves breakfast on Tuesdays through Sundays from 7am to 10:30am. It is hard to enjoy your vacation when the hotel that you're staying in is far from all the attractions. Why not stay at the Hotel Majestic? Our hotel is one of the best San Francisco hotels Union Square area has to offer. It is conveniently located near popular San Francisco attractions. I booked Hotel Majestic based on reviews on Trip Advisor and was not disappointed. The room was nice, clean, and not as small as I expected. I loved the bathroom with a quaint claw-foot tub. Cory at the front desk was very friendly and helpful. We ate at the restaurant because we were too tired to go where we had planned. Hotel Majestic is the leading vintage hotel San Francisco has in store for those who love being in the center of culture. Just beyond Japantown, is the historic jazz-inspired, Fillmore District, the home of San Francisco's Annual Jazz Festival. The district is best known for its live music, boutique shops and eclectic cuisine. The sounds and venues cater to all tastes and styles, from legends such as Tom Waits performing at The Fillmore to Harry Connick Jr. serenading at Yoshi’s Jazz Club. The neighborhood also hosts many world-class restaurants, notably, SPQR for Roman Italian fare, Dosa for Indian cuisine with modern and western influences and Delfina for the best pizza in the city. Steps away from this Edwardian hotel San Francisco residents and tourists prefer for excellent amenities, are the cultural experiences of Japantown. There you will be blown away with world class Japanese cuisine, be able to catch a movie at the state-of-the-art Sundance Kabuki Theaters, browse the many Japanese influenced shops and plazas, or simply snap photos of unique Japanese architecture.